The feeling of making progress in something which is important to you is very motivating. But sometimes you make progress without being aware of it and thus you miss this motivating effect needlessly. In this article I explained some reasons why achieved progress can sometimes be hard to notice. One reason I mentioned is sensory adaptation. This means that we get used to the progress we have made and because of this we stop perceiving it. A second reason I mentioned is that we may interpret progress negatively. An example of this is that we may view the availability of technological resources not as advantages but as perils or problems. A third reason why we may not notice progress is that we may, sometimes unconsciously, concurrently raise the bar for ourselves. When this happens, not only our competence level has increased but also the level we aim for. Because of this, the distance between our current level and our goal remains the same (or even increases). There is also a fourth reason (slightly related to the third reason) which can cause existing progress to become invisible. Due to the progress we have made we can encounter new sorts of situations which pose higher demands on us. We start to function on a more challenging level. Due to this, the distance between our competence level and the level of competence which is asked for in the situation can remain constant or can even increase. For example, when a football team gets promoted to a higher division it will have to play against much stronger competitors and it is likely that the team will lose more often. This does not mean that the team has become weaker; it may be the case that the team has even become stronger. It loses more frequently because its competitors have become much stronger. Progress may introduce us to situations in which we have to function at a higher level. This higher level poses higher demands of us due to which we may appear to be less successful and which may make it seem like we have have become worse, not better. The paradox thus is that progress can, as it were, make it self invisible. The question is how to keep a realistic eye on whether or not you are making progress. My suggestion is that, in order to do this, you have look less to 'external success' and more to specific improvements in you own mastery of relevant skills. The degree to which you accomplish external success (high grades, wins, acknowledgement, etc.) is in many cases a mediocre indicator of the degree to which you are making real progress. The relationship between external success and progress is at best loose. 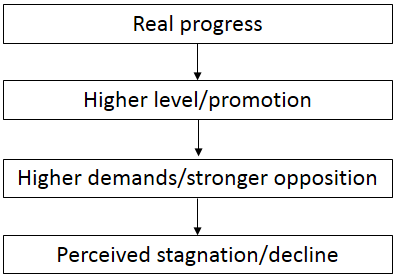 Many other factors muddle the relationship between meaningful progress and external success (as is the case my the promoted football team). A more reliable indicator of progress is your own competence. An important question for anyone interested in making meaningful progress is therefore: how can you notice from day to day that you are improving your capabilities? Thanks for once again for shedding light on an opportunity to make progress. For many years I’ve been conducting on behalf of my clients what I call, ‘follow-through’ discussions once a project is completed. Sometimes the client is clear on the progress they have made, but initially others feel that not much has changed. My question is always the same: what’s better since we last met (for the planning, stakeholder consultation, etc.)? On one memorable occasion a sales team who had been having a rough time told me, ‘…not much. In fact, it’s a bit worse!’ I persisted with, ‘There must have been some small changes…’ Eventually, one person told a story about a new kind of meeting among themselves, their clients and their own technical people. I said, ‘Wow! You told me last time that would be impossible to arrange. How did you manage to make it happen? What was the outcome, etc. ?’ Suddenly, the dam burst and all kinds of stories about progress were brought forward. They were a bit like the football team you cite. They’d moved up in the quality of their client interaction, but in finding that it wasn’t easy they assumed more negatives were happening. As they were pharmaceutical sales people they were very used to being treated negatively by doctors and their own technical team, so they assumed that it was more of the same.